Boy Scout Troop 243 offers a year-round adventure-based program designed to offer and encourage effective character, citizenship and leadership training for boys age 11-17 to help them make ethical and moral choices over their lifetime. In addition to camping, Scouts and adult leaders enjoy activities such as cycling, rock-climbing and rappelling, canoeing, council activities and more while accommodating the needs of today’s busy families. 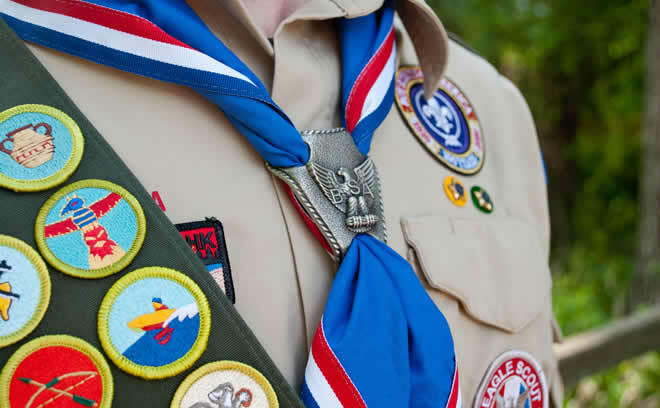 Boy Scout Meetings are held every Tuesday Evening during the academic year between 6:30pm and 8pm, usually at the at Elkhorn Area High School, 482 E Geneva St. The troop was founded in 1991 and is chartered by the Elkhorn Lions Club. Our Troop has enjoyed serving our sponsoring organization by providing assistance at the Antiques fair concessions stand, Chicken Dinner fundraisers, and more. The troop has a long history in helping the community and has seen numerous Scouts achieve the rank of Eagle. Our Eagle projects have helped local schools, parks, churches, and charities in the area. Our most recent summers have taken us sailing in the Florida Keys, Canoeing in the Boundary Waters Canoe Area, and week-long camps in Central and Upper Wisconsin. Every year we try to squeeze in biking, hiking, canoeing, wilderness survival camping, and outdoor cooking. We also attend some of the larger Scouting gatherings in the region including the Lincoln Pilgrimage in Springfield, IL, Grant Pilgrimage in Galena, IL and Circus Heritage event in Baraboo, WI.